Portable shelter can be a big help when you need a sturdy, quick, portable, temporary shelter or garage on the fly. It can be set up anywhere and any time you want. 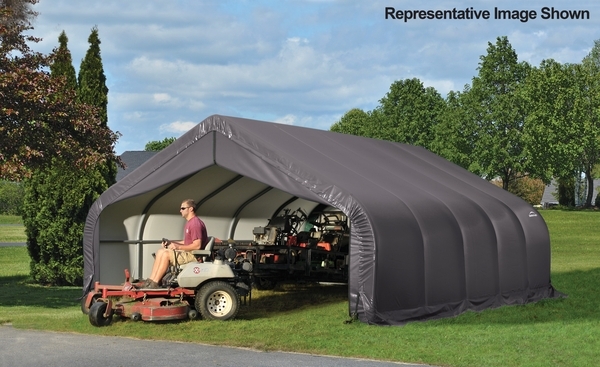 Featuring a a peak design, this shelter is perfect for storing and protecting your trucks, cars, yard equipment, tractors and other outdoor supplies. This shelter provides ample room for your cargo measuring 18 feet wide by 28 feet long by 12 feet high. does it have front and rear doors? Do they come with the shelter? Can I just buy this frame separately? Unfortunately, we do not sell just the frame. You will need to contact the manufacturer directly. 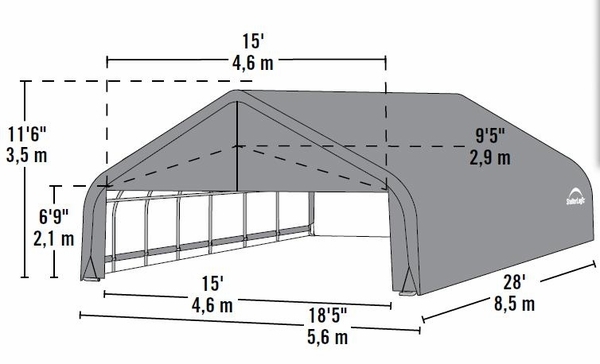 How tall are the door openings of this ShelterLogic 18 x 28 x 12 Peak-Style Portable Shelter? This shelter's door is 6 feet 9 inches. I am considering this shelter for winter storage of a couple of boats and a jet ski. I am concerned because my house is located in northern Wisconsin, specifically the Lake Tomahawk area where the snowfall is substantial and heavy at times. I normally get my boats shrink wrapped and even that has a tough time standing up to the snow. What can this shelter hold in regards to snow? This canopy does not have a snow load rating and the manufacturer recommends that any snow be removed from the top using a soft broom or mop. The only snow load rated shelters of this type we carry are the ShelterTube shelters by ShelterLogic. These are available in both gray and green in sizes of 12 x 20 x 11, 12 x 25 x 11 and 12 x 30 x 11. They can resist winds up to 80 mph and snow/ground loads of 43 pounds per square foot (when used correctly). What is shipping weight of this shelter? The shipping weight is 853 pounds.